It remained far cheaper to send bulky goods by water, whenever that was possible – a packhorse could only carry an eighth of a ton ( two hundredweight ), whereas, a barge took up to fifty tons[ii]. Between 1630 and 1640, both Stephen Bright of Carbrook and John Bright of Banner Cross, were exporting Derbyshire lead – its initial journey being by packhorse to Bawtry. In 1751, in response to increased need to trade outside Sheffield, in corn for example, the River Don was made navigable as far as Rotherham. It was not till 1819 that the Sheffield Canal was finished right up to the Canal Basin. In the 18th century, our bierlow was made up of a scattering of hamlets linked by lanes or tracks and the surfaces must have varied from poor to atrocious. By an act of 1555, people had been required to do four days’ work, unpaid, per year on road maintenance, but, by this time, this order seems to have been much evaded. The few relatively small scale maps we have from this period agree with the basic information shown on Thomas Jeffrey’s map of Sheffield of 1767 reproduced below. 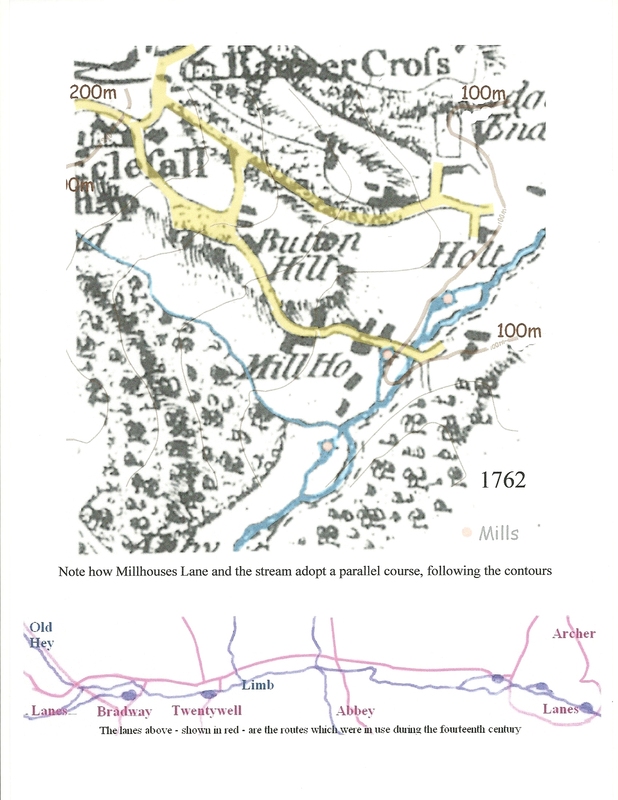 Until the end of the eighteenth century, there was no route following the course of the Sheaf up the valley; access to and from Sheffield was via Millhouses Lane, which joined the salt route from Cheshire – our present Psalter Lane; a cart track ran from Banner Cross down Carterknowle as far as Holt house and, part way down, a lane branched off to the right to connect with Millhouses Lane: another cart track ran along following the Sheaf connecting with the bottom of Abbey Lane. [ii] A.W. Skempton Engineers of the English river navigation 1620 – 1760.